Today, The Editors and Staff of Mr. Blog’s Tepid Ride (Home of the Partially Humorous Post) would like to honor Superfan Edna DeWitt, of Pinesdale Montana. Ms. DeWitt earned Superfan status by sending to us, on 30 consecutive days in April, 30 unsubscribe requests. That’s the kind of dedication we admire. In her honor, we will consider acknowledging her request sometime in the future. Once again, we check in on Newser.com, whose status as a legitimate news site is at least as dubious as ours. Poop Raining From Sky Ruins Girl’s Sweet 16. Philadelphia family suspects feces came from a plane. “Suspects?” “Suspects” feces came from a plane? What else could it be, a giant incontinent condor? There’s that old saying, that “when it rains it pours.” Thank God it didn’t happen in this case or I can only imagine what might have come pouring out of the sky on this not-so-sweet 16. Snakes Used To Have Ankles. Ancestor likely had little toes too. I have a feeling that John Johnson (if that is his real name) has a bit of a fetish. For some reason he focuses on ankles and toes when (and I read the story) the bigger, scarier, and real story is that they had legs. Not just ankles and toes connected to nothing, but legs, which makes the whole idea of snakes on a plane that much worse. “I have had it with these mf-ing snakes with their mf-ing legs on this mf-ing plane!” If snakes still had legs the jig would be up for humanity, although I think that some enterprising sneaker executive could make some cash on it. But snakes with ankles, shapely, curvy ankles, and cute little, alluring toes, that’s the writer’s take on this story, Sheesh. “Exciting” New Rabies Strain Found In New Mexico. It was discovered after rabid fox bit woman. I can just imagine that woman’s excitement when, after a painful round of rabies treatment, the doctors informed her that she was infected with a new strain of the potentially fatal disease. Yup, and I’m sure the excitement grew even greater when she had to undergo even more painful injections and invasive tests to identify the new strain. I’m just sorry that I wasn’t invited to her party, complete with clowns, cake, and vaccines. Latest Target of Kim Jong Un’s Wrath: Failed Lobster Breeders. Says terrapin farm may “impair prestige” of Korean Worker’s Party. Because nothing else going on in North Korea could negatively impact their international prestige like a lobster breeding farm gone wrong. I just don’t see how a lobster breeding farm could possibly fail, as lobsters are well-known as the randiest creatures in the sea. I think this is how the Roman Empire fell. 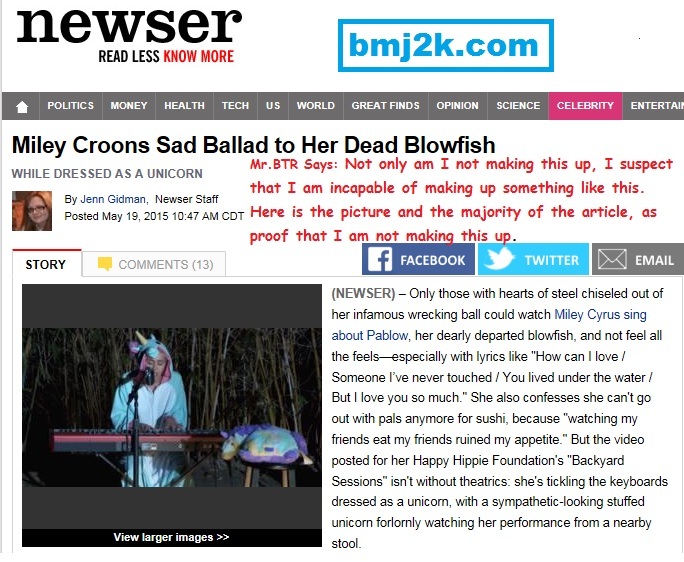 Miley Croons Sad Ballad to Her Dead Blowfish. While dressed as a unicorn. Well of course! What else should I have expected? I mean besides almost anything else. I am eagerly looking forward to her next ballad about all the sad lobsters in that failed lobster breeding farm.